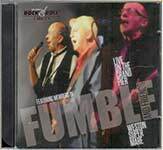 Fumble Live Double CD released! Fumble & Friends, Wednesday 28th December 2011. Get your dancing shoes on for a night of fun at the Grand Pier in Weston-super-Mare this December. After a break in 2010 Des Henly is back with a party on the new Grand Pier in Weston-super-Mare. Popular Christmas music show not coming to Weston for the first time in 24 years. "The Reading Festival: Music Mud and Mayhem"